Browse: Home / The annual charity BEE Fayre is back and buzzier than ever! The annual charity BEE Fayre is back and buzzier than ever! BJ Sherriff presents two days of activities, talks and fun in aid of the Bumblebee Conservation Trust, Cornwall Wildlife Trust – Bee Kind Appeal, Bees Abroad and Bees for Development. 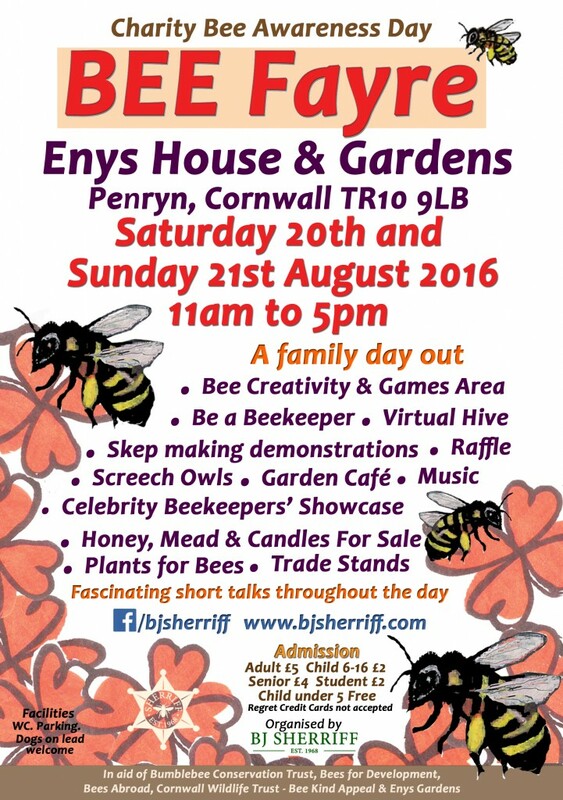 The annual charity BEE Fayre will take place on Saturday 20th and Sunday 21st August 2016, from 11am to 5pm. 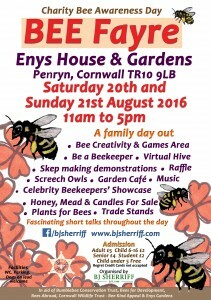 The two-day event will be held at Enys Gardens, Penryn TR10 9LB and will be a fun day out for all the family. The BEE Fayre will be held primarily in the Enys House and admission will also give you the chance to explore all of the lovely gardens. At BJ Sherriff we are becoming increasingly concerned about the lack of bees and it would seem that amongst the general public globally the concerns are the same and with this in mind we have organised our charity bee awareness day. With the help of knowledgeable beekeepers, who have volunteered to assist on the day, we are hopeful that many of the public’s questions can be discussed and answered as well as introducing people to the world of bees. Over the course of the weekend there is a busy line-up of events planned including talks, demonstrations and workshops all about bees and beekeeping from experts in the field. The Bee Farmers’ Association will discuss beekeeping as a career, the University of Exeter will be talking about studying bee colony survival, the Bumblebee Conservation Trust will highlight the plight of the bumblebee and the Cornwall Wildlife Trust will show the work being done through Cornwall to preserve bee habitat. There will also be traditional skep making demonstrations by Martin Buckle showing you how to craft a basket beehive. You will also have a unique opportunity to take a close look inside of a virtual beehive, kindly lent to us by the Cornwall Beekeepers Association and Carole Allen. Stands at the BEE Fayre include BJ Sherriff Beekeeping Clothing and Equipment, Beegifts.com, Cornishbees.com, Cornwall Wildlife Trust, Bumblebee Conservation Trust, Falmouth University BeeSoc, Bee Craft, Northern Bee Books, Nine Maidens Honey and Mead, Cornwall Wildlife Trust, Neal’s Yard with Honey Cosmetics range, Plant stall run by Anne Pengelly, Bees Abroad (of which Brian Sherriff is Patron). With more stalls being added all the time. Outside of the manor house you’ll be able to pick up some bee-friendly plants and bulbs for your garden. Annie’s Kitchen Garden Café will also be open throughout the event for tea, sandwiches and cake from 11am to 5pm and we’ll even see if we can get some Enys Honey cake on the menu! On Sunday from midday, the Screech Owl Sanctuary will host an awe-inspiring demonstration of birds of prey. Over the weekend there will be a creativity area for children to spot the BEE Fayre bee, as well as make a candle to take home and dress up as a beekeeper activity. Come along and see our Celebrity Beekeepers Showcase, past and present. Also, there will be the Bee Safari leaving from the Bumblebee Conservation Trust stall throughout the day so plenty for budding young beekeepers to see. We have a jam-packed line up of exciting guest speakers over the course of the BEE Fayre, speaking on a range of topics from ‘Bees as a career’ to ‘Polyhives and the hierarchy of bees’. Our line-up for Saturday and Sunday will be revealed soon – check back here for more details. If you would like to volunteer on the day to help with the BEE Fayre, please get in touch with Charlotte – bjsherriff.marketing@gmail.com. Admission is Adults £5, Child 6-16 £3, Seniors £4, Student £2, Children under five go free. Facilities include parking on site, dogs on leads are welcome. This event has been organised by BJ Sherriff and is in aid of Bumblebee Conservation Trust, Bees Abroad, Cornwall Wildlife Trust – Bee Kind Appeal and Bees for Development.